Thomas Wolfe made that phrase famous. It was the title of his posthumously published 1940 novel, and it has since made its way into widespread popular usage. It's true. But it's not true at all. I knew the truth in 1980 when I returned to my home grounds after ten years away in Colorado. Nothing was the same. The old touchstones that lent comfort and security to my youth felt empty and stale, worse, unreachable. The new me reacted to the familiar places and changed people in new ways, making them all seem alien. It was scary, a rude lesson. I think I was having what my generation called a 'mid-life crisis'. Mid-life is far behind me now. Now, as I come back home to these once familiar places where I first dreamed my innocent dreams, I find that I have sorted the bitter from the sweet, the hopes from the reality, the past from the present. Couched in a new more robust security of maturity, I find that home is still there after all. It had never disappeared. Rather, it had become legend. A good legend is timeless. So as I left the Mason-Dixon Trail and wandered the streets where I grew up on the north side of Wilmington, DE, I looked for the timeless. And I found it. Rockford Park with its wide sweeping sledding hill, its century-old iconic water tower overlooking Brandywine Creek, and that rock where my brother and I posed for Dad in 1953. They were all still there. Look at the headline photo up top. Every crack and crevice of the rock looks the same. You see, time changes us, and it tries to change everything around us, but after we live the reality it gradually becomes legend, and time only amplifies a legend. 246C Thomas Drive, Wilmington, Delaware, part of the newly constructed Monroe Park Apartment complex, is now 246C Presidential Drive, Greenville Place Apartments, Greenville, DE. The landscaping trees have gone from spindly sticks to majestic monarchs. But the bones are still the same. 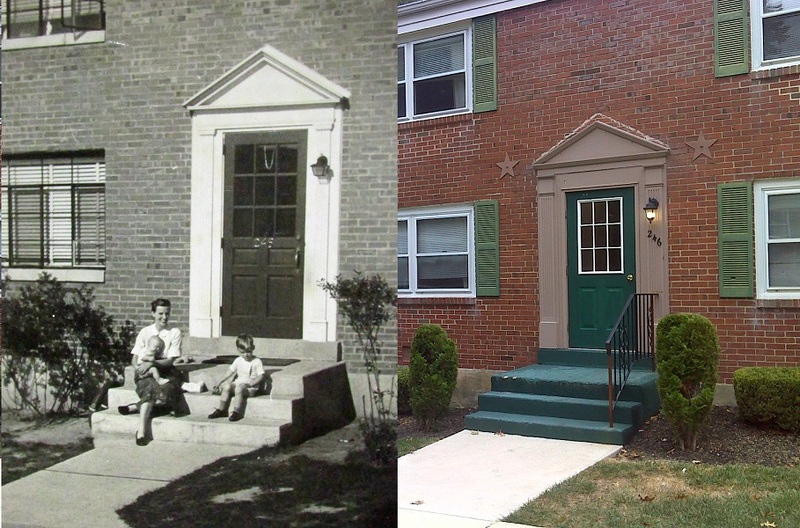 The pattern in the bricks is the same in the photos from 1951 and 2016. Look to the left of the door for the ones with dark staining in the second photo headlining this post. The legend is this: It was 1951. 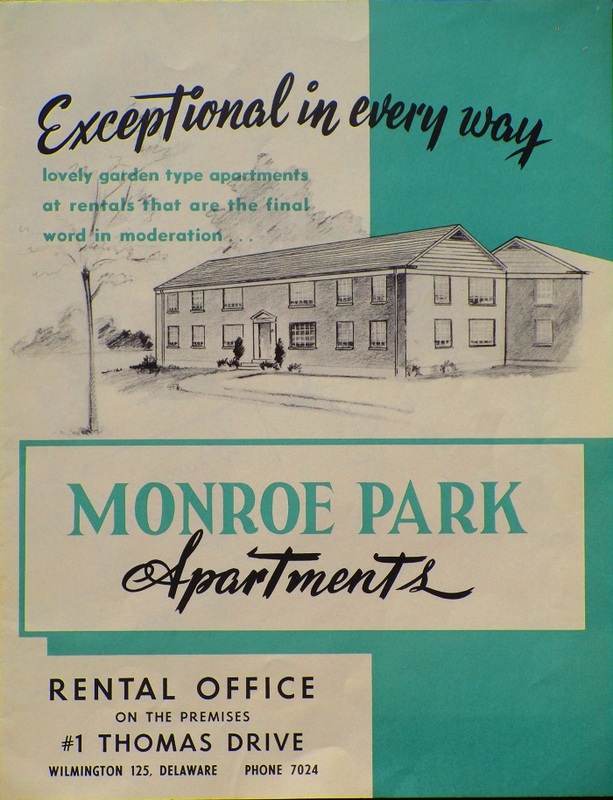 When my Dad finished his PhD and took a job at DuPont for $480 per month he rented an apartment in Monroe Park, sight unseen. There I had my first adventure, wandering off on my tricycle until I got lost. I ended up trying to escape across a field beyond the apartment complex with older kids throwing rocks at me. Mom came to the rescue. 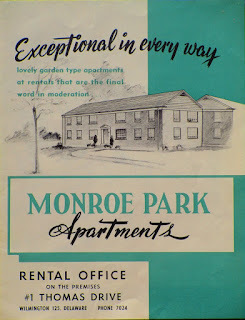 After two years we moved to a duplex at 1410 Riverview Avenue, just four blocks from Rockford Park. The house had a wonderful front porch then, with room for a swing, rocking chairs, and even a table. Somebody ripped out that porch, but the bones are still there. And the legends. I still have the big scar on my knee that I got trying to ride a 24-inch bike that was taller than I was. Dad had just taken the training wheels off my little bike with the 14-inch wheels. I started school at newly constructed Highlands Elementary. 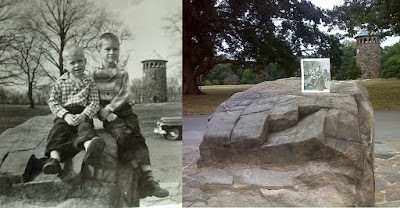 That playground was paved even way back then. We stayed there until I finished the fourth grade, then we moved out into the country to our new house on White Clay Creek. I've covered the White Clay Creek memories and trail reports previously. 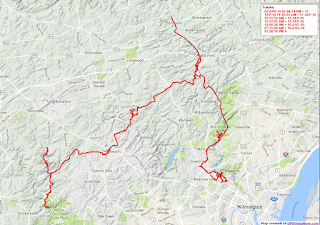 This report is about the rest of the Mason-Dixon Trail east of there to its eastern terminus at the white-blazed Brandywine Trail near Chadds Ford, PA. There's a fair amount of road walking on the M-D T connecting White Clay Creek with Brandywine Creek. But there's a nice walk through the Auburn Heights Preserve where the huge Victorian-style Auburn Heights Mansion stands. There's a museum devoted to early steam-driven automobiles there, and every year in mid-September the owner, now in his 90's, holds an antique car show and opens the mansion for the public to tour. The trail then crosses into Pennsylvania and plunges into some nice woods, part of the a conservancy property in Southern Chester County. Other parts of the conservancy property continue to be farmed by the owners, and the M-D T is routed through the heart of some of the corn fields. ... and then on to join the Brandywine Trail along Brandywine Creek. The Brandywine Trail runs north from there to connect with the Horse-Shoe Trail. To the south it comes to an end in Wilmington near Rockford Park and my early childhood homes. This is a proprietary trail for members of the Wilmington Trail Club. It crosses some private land where the owners only allow passage during club events in the spring. I hiked that with the club's annual spring group-hike on a rainy Saturday this past April. Leaves were not out on the trees yet, and views of the creek were abundant. ... and passes an even more historic covered bridge. A few days ago I hiked the connecting route from the southern end of the Brandywine Trail to Rockford Park, and as I got there I found preparations underway for a Charity 5K walk/run. It was sponsored by the local branch of Lutheran Community Services. I had the time, it seemed like a good cause, so I signed up on the spot and even bought a t-shirt for an extra contribution. It turns out that this was the 25th anniversary run, and somebody had put together a quilt made up of all 25 of their t-shirts. The course covered most of the roads through Rockford Park and also came out on Pennsylvania Avenue where we had a lane closed just for us. I finished the 5K in 51 minutes, which is a brisk walking pace for me, then bade them farewell and headed on back to the Brandywine Trail on some quiet roads along the creek. Fall was approaching and the weather was cool and comfortable for this set of hikes. 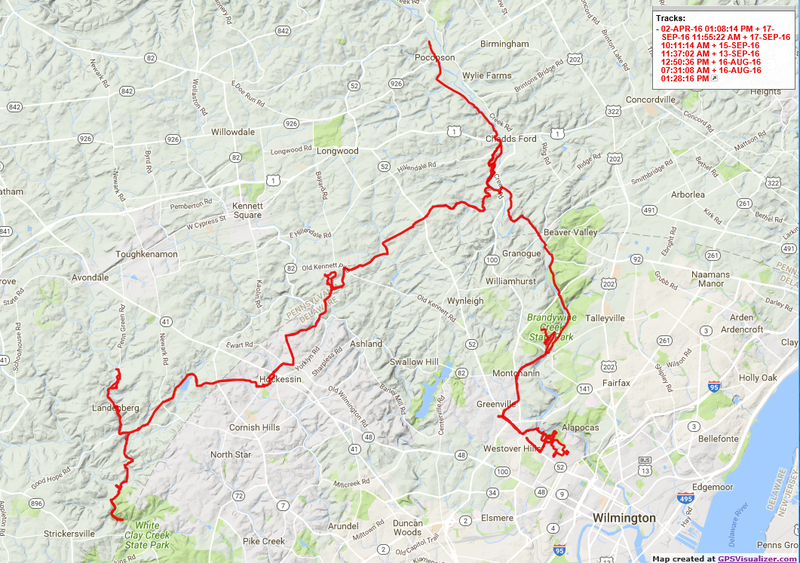 Below is a composite of the GPS tracks that I recorded as I walked, connecting me from White Clay Creek to the North-South Brandywine Trail and my early childhood homes. Next I'm headed west and to hike the western part of the M-D T which runs along the west bank of the Susquehanna River from near Chesapeake Bay all the way up to north of York, PA. Keep watching this space.